After the two nights in Salt Lake City, the “Chin Chin” company packed up and headed to Ogden, UT, only 35 miles or so, to play at the Orpheum Theater. The paper on Friday the 21st saw the first advertisement for the show coming to the Orpheum. There was also a short advertising article about “Chin Chin Comes to Orpheum.” In the paper of the 22nd, there was a larger display ad for “Chin Chin”, an advertising article, and the now familiar photo of the “Four French Dancing Dolls.” The Ogden Examiner also ran several articles regarding Chin Chin and included the 16 women photo we’ve seen elsewhere. 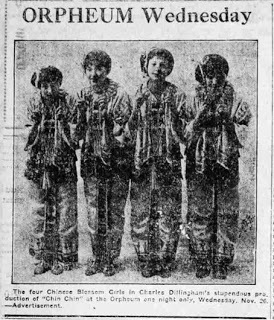 On November 24th, the Ogden Standard ran a new (for us) photo, this time of “The Four Chinese Blossom Girls.” Unfortunately, the quality of the photo is again insufficient to be sure if Donna is there or which one is Donna. I believe that the two middle women are other people but Donna could be either end person. Hopefully, we will find a better image of the four another time. Apparently there was extremely bad weather the night of the show. Depending upon which paper you read it was either a gale or a blizzard. In either event the Ogden audience wasn’t daunted by the weather. “Chin Chin” an oriental fantasy, gorgeous in its investiture and colorful settings attracted a good house in the Orpheum theatre last night, dispute the gale that blew on the outside. There were lots of girls, some beautiful and some just girls, but ensemble they made a good impression as their voices blended harmoniously. The costuming showed discriminating taste — Charles Dillingham’s hand plain enough — and the __? ?__ went over with a bang, but—- And here’s the fly In the ointment– did you ever go up to a soda fountain and asks for a gin fizz or something like, and when you tasted it found that the dispenser forgot to put in the “fizz,” the drink was flat, you know. Well, that was just the matter with this production of “Chin Chin,” the dispenser forgot to put in the fizz –the seasoning was a little short. However, on the whole, the show went by good after the f!r«t act, and picked up well just about the time the clown band got going strong. There is practically no plot to the variegated performance. In the first act there were Aladdin and Violet Bond, a charming young American girl who drops in Pekin in search of a magical lamp, and the action is centered about her adventurer. Carlton Reiger, well known in Ogden since he first came here with “Mickey” last summer was Aladdin. He joined the show in Denver and despite the short time has been with the show gave a creditable performance. He had a good lead voice and really was one of the shiny spots in the show. Roy Binder and Walter Wills were the two dashing comedians who did extremely well in their specialities. Others who carried their parts better than average were Donna Montran as “Goddess of the Lamp,” Neva Larry as “Sen Sen” and Irene McKay as “Fan Tan,” and Ethel Lawrence as the “American Girl.” Both Miss Montran and Miss Lawrence have pleasing voices. The Teddy Bear dance was an Irish number and the clown saxophone band was the hit of the evening. Unfortunately, however the production was in now way one to call forth very hearty applause or admiration. Much of the music was very old without being at the same time good enough to be worthy of a long remembrance. The costumes and srake [?] settings were fairly attractive. The singing and acting, with one or two exceptions, were not on high grade. Roy Binder and Walter Wills were the principal comedians and in most of their work did well. Carlton Reiger, who appeared here as soloist at the first production of the moving picture, “Mickey” was not seen to advantage in his part. By far the most amusing and interesting items of the performance were contributed by the Saxophone Sextet, whose number would be a considerable headliner by itself on any vaudeville bill. In extenuation of a poor performance it is to be borne in mind that the artists were most probably suffering greatly from cold on the stage. The Grand Opera House in Ogden, Utah, was build in 1890. It was a Romanesque style building with a seating capacity of 1,600 people. 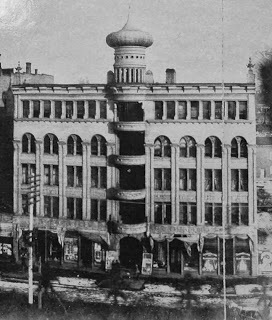 In 1909 its name was changed to the Orpheum Theatre after the Orpheum Theater Circuit which was a chain of vaudeville and theaters. The chain ultimately became the RKO – Radio Keith Orpheum. In 1928 the theater was renovated with new ventilation and sound; the “Jazz Singer,” the first “talkie” played there in June of 1928. Seating in the theater continued to get smaller and smaller with each renovation; the Film Daily Yearbook said the theatre’s seating was 1,037 in 1950. It became exclusively a cinema in the 1940s and operated until 1982. In 1983 it was torn down to provide additional parking for the Ben Lomond Hotel. The Ogden Standard (Ogden, UT) Nov 18, 1919, Page 11 via Chronicling America, Library of Congress. The Ogden Standard (Ogden, UT) Nov 21, 1919, Page 8 via Chronicling America, Library of Congress. The Ogden Standard (Ogden, UT) Nov 22, 1919, Pages 11 & 12 via Chronicling America, Library of Congress. The Ogden Standard (Ogden, UT) Nov 24, 1919, Pages 5 & 9 via Chronicling America, Library of Congress. The Ogden Standard (Ogden, UT) Nov 26, 1919, Pages 11 & 12 via Chronicling America, Library of Congress. The Ogden Standard (Ogden, UT) Nov 28, 1919, Page? via Chronicling America, Library of Congress. Previous Previous post: Donna in Salt Lake City, November 24th & 25th, 1919 at the Salt Lake Theater.